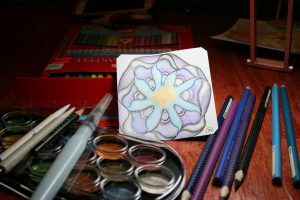 I’ve seen some really beautiful Zentangle tiles done in the last year that had some color added by Zen Linea on facebook. She uses some watercolor pencils to add the color. Thus I got the itch to try my hand at it too. The problem was that I didn’t have any. I decided to go looking at either Hobby Lobby or Michael’s. Both have a weekly coupon, which is nice. Well I hit the jackpot. 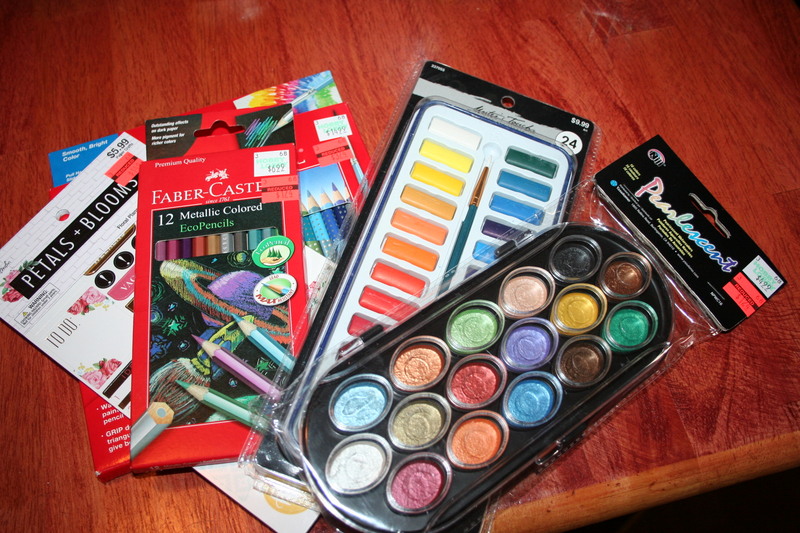 I got some Faber Castell watercolor pencils for just $3.24 on clearance at Hobby Lobby! The regular price on them was $14.99. Awesome!!! I used them on my tile last week and really liked them. But there’s a learning curve to using them in Zentangles (well, I guess it would technically be called a ZIA), at least there is for me. I also got some metallic colored pencils. They were just $1.74 down from $6.99. The pearlescent watercolors were marked down from $4.99 to just $1.24. I used them to add a touch of sparkle to my tile last week. Also in the Hobby Lobby loot was a package of planning stickers. These are like a nice heavy weight cardstock and were on clearance from $5.99 to $1.49. (I really don’t like ending sentences with a price because then you have a period and a decimal way too close together. ) The stickers are really pretty florals. Tiffany and I each got a set. It’s hard to turn down such good prices. My big purchase was the watercolor set of 24 colors. It was regular price at $9.99 but I had a coupon and got it for like six or seven dollars. Awesome! Then we went into Mardel, because it is right next door and we like to peruse their bargain books, where we frequently pick up books for a dollar each. Here’s the few things I picked up there. 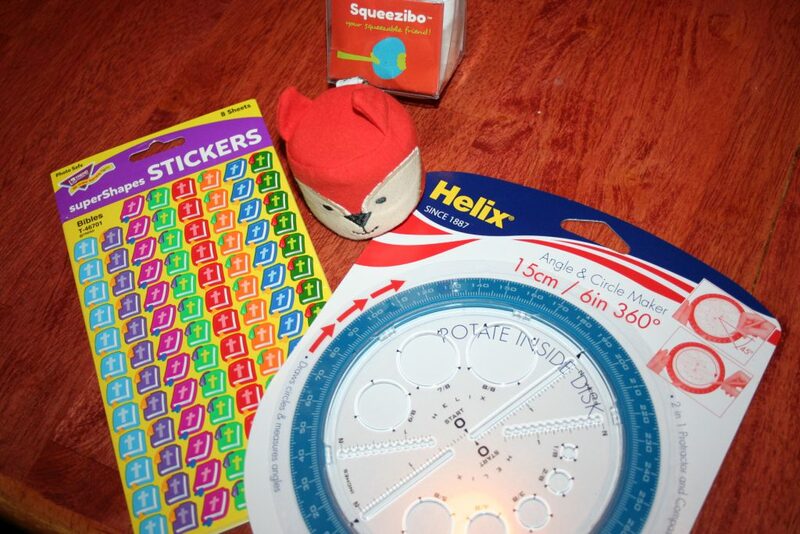 One of the reasons I’d gone into Hobby Lobby was to get this Helix, circle maker. I’d seen a video by Dawn that showed how she used this neat little tool. I think it was $5 but . . . you guessed it, I had a coupon on their app and got 30% off. I’d also been wanting to get some Bible stickers for my bullet journal. I wanted to add it when I write about things in the Bible but I only had a few, very old, ones and hadn’t been able to locate any yet. Well, Tiffany helped me find these in the education section of Mardel. I liked these because they have lots of different colors, so it won’t be boring to see the same sticker all the time. They were about two dollars and change. The last thing on my spree was the fox squeeze toy. My wrist has been hurting me a bit and Michael said I should get a squeeze ball of some kind. Since this one is adorable and on clearance, I got it. I had fun getting deals. I hope you enjoyed a look at my new supplies.